Miles away from clashes between ISIS and Kurds in Syria’s border city Kobani, the brutal Syrian civil war still goes on in the Idlib province. Islamic Front opposition brigades, militants from al Qaeda-affiliated Jabhat al-Nusra and several United States-backed Free Syrian Army groups fought each other and Syrian President Bashar Assad’s army throughout the week, culminating in what activists called a "massacre" at an Idlib refugee camp and an alleged temporary truce between rival opposition forces and the Nusra Front. At least 60 people were killed when regime helicopters reportedly launched a barrel bomb attack on a camp Wednesday morning, an activist told al-Jazeera. A video of the attack was widely circulated on social media Wednesday and shows scores of people, including many women and children, who appear to have been hit by shrapnel in burning tents. "It's a massacre of refugees," said a voice off camera. Barrel bombs are improvised explosives made from metal containers that are filled with nails and shrapnel. This is not the first time the regime has been accused of using such weapons, despite a United Nations resolution that prohibits them from being used in highly populated areas. 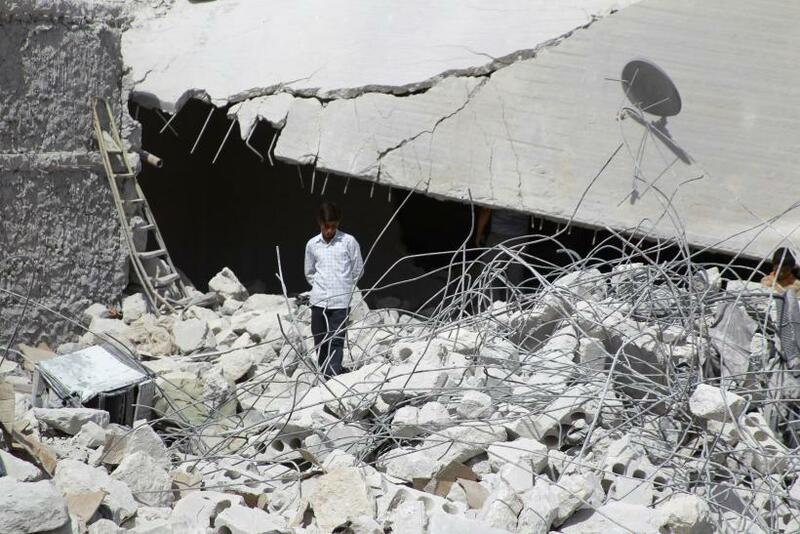 For over a year the city of Idlib was controlled by regime forces, but earlier this week Nusra Front militants stormed a government building and killed dozens of Assad's troops, International Business Times reported Monday. On Tuesday, Nusra fighters turned their weapons on FSA opposition brigade Harakat Hazm and the Syrian Revolutionary Front, two of the largest Western-backed brigades. Fighting between the Hazm brigade and Nusrah in Aleppo reportedly ended Wednesday after opposition Islamic Front brigades Ahrar al-Sham and Suqur al-Sham negotiated a temporary truce that stated the two groups would not attack each other near Aleppo, according to a pro-opposition news site. Despite calls from several opposition brigades under the umbrella of the Islamic Front, clashes continued into Wednesday night between the Syrian Revolutionary Front and Nusra. While it is not uncommon for opposition forces to fight extremist militants, the Islamic Front, an opposition umbrella organization, condemned the clashes. The Islamic Front wanted to neutralize the area around Aleppo from internal strife in order to present a unified front against attacks from Assad’s regime, according to a statement released Wednesday.